Our expert greenhouse consultants will help you to choose the finest glass greenhouse and glass greenhouse supplies for your price range. Glass Greenhouses are luxurious, beautiful and permanent. For many people glass greenhouses are the iconic greenhouse, where the clarity of the glass truly creates a feeling of the outdoors when indoors, surrounded by their own cultivated paradise.This alone is enough reason for so many people to choose glass over polycarbonate or polyethylene film for a greenhouse covering. There are many other advantages to a glass greenhouses as well. 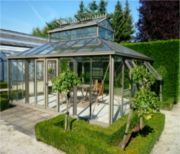 Garden Green Pavilion Greenhouse - Garden Green Greenhouse is a beautiful and stylish greenhouse, High tech materials and VSG 6 mm double layered with film for roof covering, ESG 4 mm tempered glass for Wall Coverings. 'Old World' Victorian Greenhouses 'Old World' Victorian Greenhouse is 15' wide,19'11" long , 12'2" high elegant classic looking style, This model features 4mm thick safety glass. RBH Glass Greenhouse- The RBH Victorian Greenhouse is a 10ft wide, 15ft long, 9ft high elegant metal and glass greenhouse. This model features 4mm thick safety glass, double swinging doors, and four roof windows with automatic openers. Royal Victorian Orangerie Greenhouse -The Royal Victorian Orangerie is a 10ft wide, 15ft long, elegant metal and glass greenhouse. This model features 4mm thick safety glass, double swinging doors . 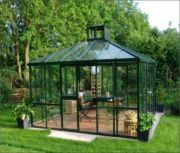 Royal Victorian Glass Greenhouses-This classic Victorian Greenhouse kit provides the optimum environment for gardening year round while adding a stately presence to any backyard setting. The dark green aluminum framework, tempered glass panels and full 6' 7" wall height combine to give you a comfortable interior workspace and a full view of your surroundings. The overall height is 9'2" feet.